In time for Dry January, Borough Wines has launched an alcohol free ‘gin’ that mimics the aromatic profile and complexity of the spirit, priced at £20 a bottle. 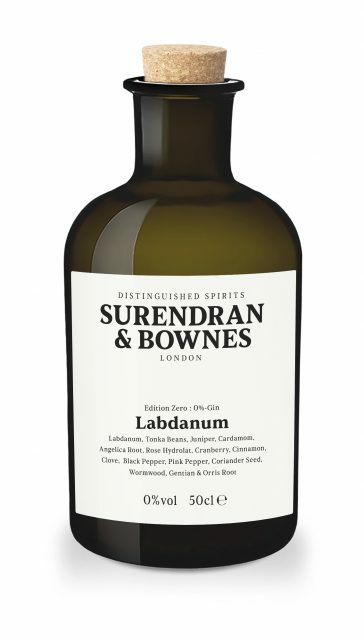 Called Labdanum, the 0% alcohol ‘spirit’ is made by Surendran & Bownes and is designed to give “discerning drinkers a detox-friendly spirit alternative”. The distiller has experience in the non-alcoholic spirits arena, having developed a 0% ABV gin for the St James’s Hotel in London in 2015. Its makers claim the organic, vegan-friendly, alcohol-free ‘spirit’ is similar to the ‘London Dry’ gin style, but has “added complexity from the use of exotic aromatics more common in perfume making than gin production”. Among the botanicals in the juniper-dominant blend are tonka bean for richness, wormwood to add a herbaceous edge, rose water, cranberry and orris root for fruity, floral notes, and coriander seed, cinnamon, cardamom and clove for spice. Its namesake botanical – labdanum – a rich brown resin from the rockrose shrub used since ancient times – imbues the ‘gin’ with a “deep, powerful, amber note”. Its makers suggest enjoying it with tonic, with three parts tonic to one part Labdanum, garnished with star anise. Last month Surendran & Bownes released Santal Gin priced at £39 a bottle at Borough Wines, which includes an exotic array of botanicals, from ambergris, wild honey from Zambia, Australian sandalwood, Darwin pea, osmanthus and white flowering plant Queen Anne’s lace. Labdanum has gone on sale at Borough Wines’ nine shops priced at £20 for a 50cl bottle. A little rich to compare this £20 a bottle (50cl) favourably without comparing LFL vs 75cl product? Now you won’t post this comment as it’s not favourable?? Hi Bill, we’ve ensured that the botanical concentration in the Edition Zero is sufficiently high that one 25ml measure should give you a comparable level of flavour and aroma to an equivalent 50ml of spirits… sans the equivalent alcohol content, of course. A bottle of Edition Zero will make 20 non-alcoholic ‘gin’ and tonics for example.